If you can get it out, how are you getting it in? How many of you have looked at ways to improve your exhaust? Have you bought a larger turbo housing, a cat-back exhaust systems or even went to a 4 inch exhaust to increase power and efficiency to eliminate restrictions in the exhaust flow. Have you upgraded with cam plates, injection pumps, injectors and or modules? If you are getting more fuel in and more exhaust out how do you compensate to get more air in? Drilled holes in your air-box? Bought a higher flowing filter? Or have you even ducted to the air box to get cooler air in? In the natural progression of upgrades to increase the performance of your vehicle the Air Bulldog induction system is the next logical step. For years Camaros, Corvettes, 442s, Mustangs, Road Runners, Trans Ams, and many European exotics have used ram air type induction systems to boost performance. These high performance vehicles have benefitted from drawing cool outside air into their intake systems. Our Dodge Rams are also high performance vehicles and we put them to the test daily. From towing fifth wheels, horse trailers, car trailers and whatever else we can think of. The Air Bulldog induction system is comprised of a fully functional Ram air hood, a custom air box and a unique aft. cooler. The hood is hand laminated fiberglass, gel-coated to 24 mills and finished inside and out. This hood accepts all stock hardware and bolts on just like your stock hood. The right scoop force feeds air to the custom fiberglass airbox via a massive 6” tube. The air then proceeds through the air filter into the turbo. The left scoop forces air through the aft. cooler which is a 4” inch pipe that encloses a 3” inch tube from the intercooler to the intake manifold which further cools the air just before it enters the engine. The intercooler and aft intercooler decreases the temperature of the air entering the engine after it leaves the turbo charger. Therefore, when this air reaches the combustion chamber the charge density is increased. This results in greater horsepower and economy. 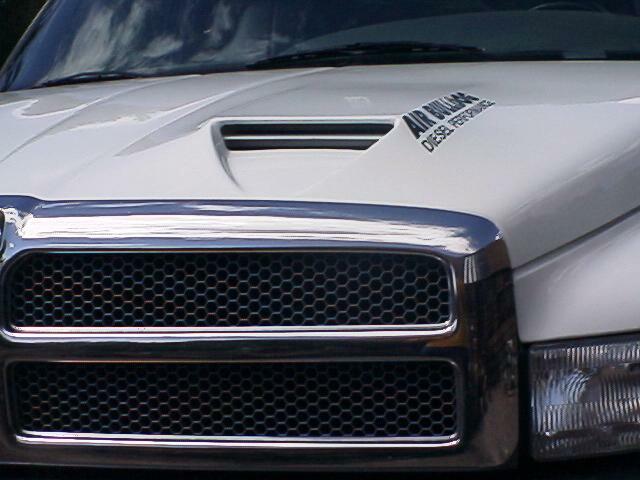 Optional naca-ducts for the hood are designed to extract trapped heated air under the hood, thus promoting more air travel through the radiator and intercooler, and reduceing cab temperature.